— He attended drawing lessons at the Normal Art School, Boston MA, and art classes with W. A. G. Claus. From 1877 to 1880 he was apprenticed to a lithographic company in Boston. In 1879 Tarbell entered the School of the Boston Museum of Fine Arts, where he was a student of Otto Grundmann [1844�1890], a former student of Baron Hendrik Leys in Antwerp. In 1883 Tarbell left for Paris with his fellow student Frank W. Benson. Both Tarbell and Benson attended the Acad�mie Julian, where they studied with Gustave Boulanger and Jules Lefebvre. They traveled to Italy in 1884 and to Italy, Belgium, Germany and Brittany the following year. Tarbell returned to Boston in 1886. Initially after his return, Tarbell made a living from magazine illustration, teaching privately and painting portraits. In 1889 Tarbell and Benson took Grundmann�s place at the Museum School. Tarbell was a popular teacher, whose prominence was so marked that his students were called �Tarbellites�. His teaching methods were traditional and academic: he required his students to render casts before they were allowed to paint. His motto was �Why not make it like?�, a query that shows his dedication to the model. Marc-Aurèle Fortin was a student of Tarbell. 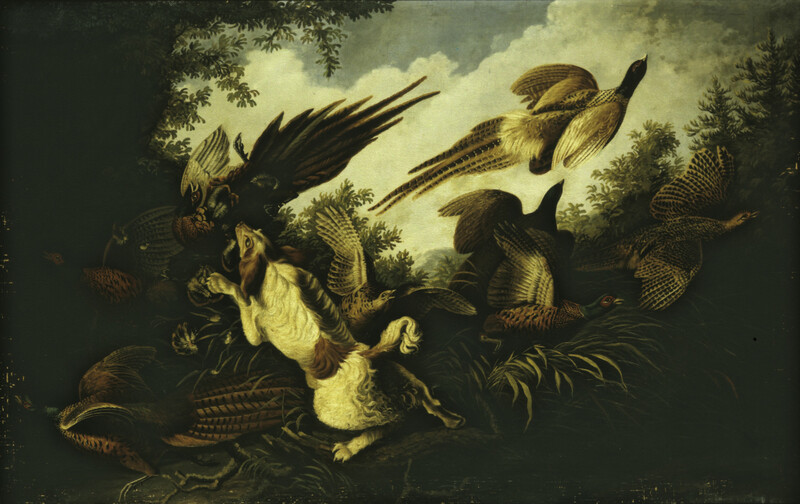 ^ Died on 26 April 1808: Jean~Baptiste Pillement, French Rococo painter and draftsman born on 24 May 1728. — He was an extremely varied and prolific artist who became fashionable early in his career. First trained by Daniel Sarrabat in Lyon, Pillement received a good grounding in the Rococo style of genre painting exemplified in the work of Antoine Watteau and Fran�ois Boucher. After a brief spell at the Gobelins, in 1745 he left for Madrid. He stayed there for three years, and his work was much appreciated both in Spain and in Portugal, which he visited often. He supervised sets of Rococo singeries and chinoiseries painted for Quinta de Alegria, the house at Seteais, near Sintra, of the Dutch consul in Lisbon, Jan Gildemeester, and soon after he was offered the title of Painter to the King. He declined this honor and instead went to London. There he stayed for the next 10 years, during which time he fully exploited the English taste for landscapes. In addition to his brightly colored, artificial landscapes, inspired by Nicolaes Berchem and Claude-Joseph Vernet, Pillement painted fancy pieces, which were theatrical in composition and inspired by prints rather than nature. In 1761, having sold off his remaining work at the annual exhibition in London of the Society of Artists, Pillement went to Vienna. In 1763�1764 he decorated rooms at the Hofburg and he also worked for Wenceslas, Prince of Liechtenstein. In 1766 Stanislaw II Augustus Poniatowski, King of Poland, requested that Pillement decorate interiors at the royal castle in Warsaw. The result was a room of exquisite chinoiseries as well as the Pillement Room at the Ujazdow Palace. Made Pictor Regius by the Polish king in 1767, Pillement had in the meantime discovered a new method of printing on silk with fast colors (recorded in his Memoirs, 1764). — Francisco Vieira Portuense was a student of Pillement. Ferdinand-Eugène-Victor Delacroix, French painter who died on 13 August 1863.  Delacroix was the fourth child of Victoire Oeben, a descendant of the Oeben-Riesener family, which had created furniture for the French king and court in the 17th and 18th centuries, and (supposedly) of her husband Charles Delacroix, a government official, who was ambassador to Holland in 1798 and who died in 1805 while prefect of Bordeaux. But his biological father was probably the diplomat and statesman Charles-Maurice de Talleyrand Périgord. His early education was at the Lycée Imperial. In 1816 he began to study painting under Pierre Guérin [13 Mar 1774 – 16 Jul 1833] at the École des Beaux-Arts, where he received a formal classical training in the manner of David. Delacroix's eclectic interests extended beyond the academic study of works by Michelangelo, Rubens, Veronese, and Tintoretto at the Louvre, to being influenced by the romantic poets of his time like Byron, as well as Dante, Shakespeare, medieval history, and the Orient. 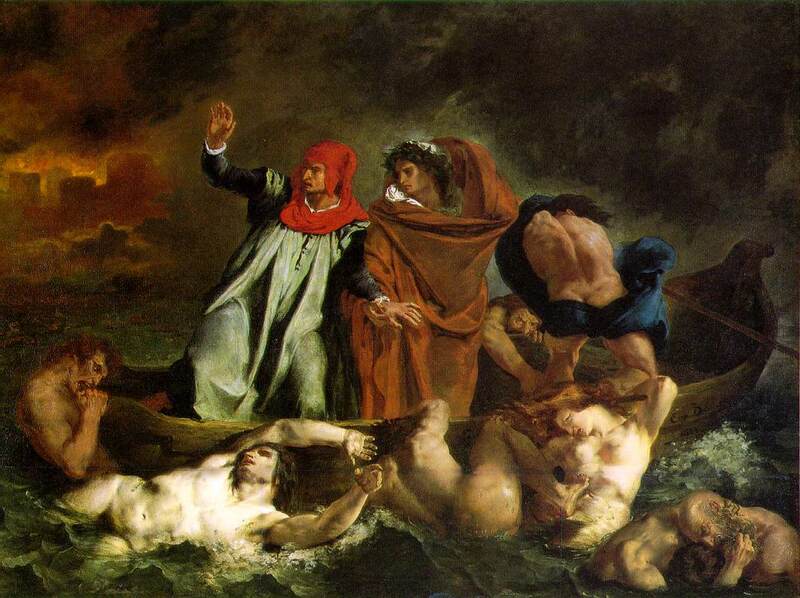 His début at the Salon of 1822 with the painting La Barque de Dante established Delacroix as one of the leading artists of French romanticism. He traveled to England in 1825 with his close friend Richard Parkes Bonington [25 Oct 1801 – 23 Sep 1828] to study the use of color in the paintings of such artists as Sir Thomas Lawrence, William Etty, and Sir David Wilkie. During his stay he also filled many sketchbooks with studies of antiquities and animals. 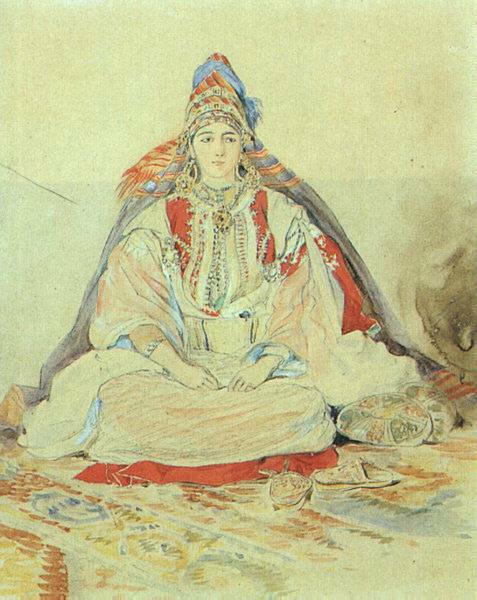 In 1832 he accompanied the Comte de Mornay to Morocco, Algiers, and southern Spain, creating many vividly colored works of North Africa and its exotic peoples. — In 1815 Delacroix joined the studio of the Neoclassical painter Pierre-Narcisse Gu�rin, where he met Th�odore G�ricault. After G�ricault�s death in 1824, Delacroix became the head of the Romantic school in France. 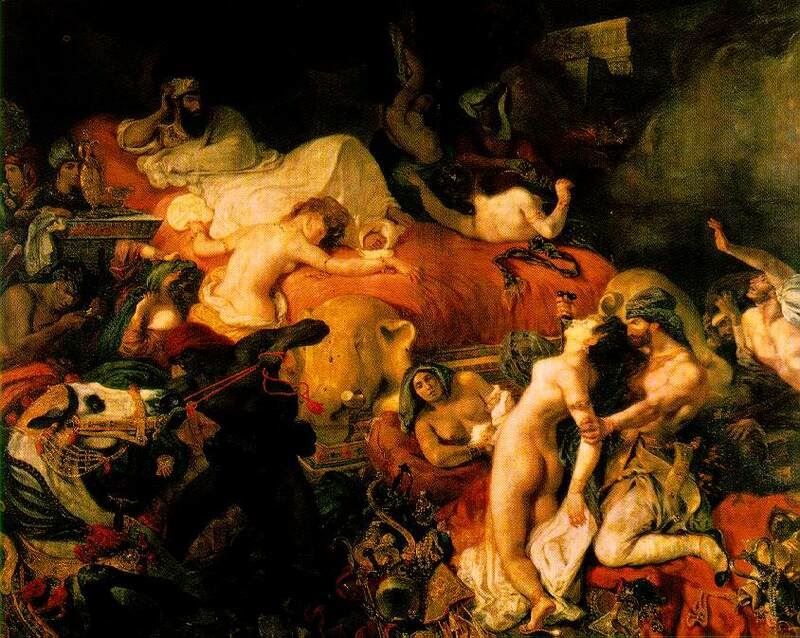 Delacroix�s paintings exhibited in the 1820s at the Salon were a dramatic success, including The Bark of Dante (1822), The Massacre of Scio (1824), and The Death of Sardanapalus (1827). In the 1820s the artist preferred literary and historical subjects, rarely turning to themes from actual life. However, his most famous painting, Liberty Leading the People (1830), is dedicated to a contemporary event, the July Revolution of 1830. 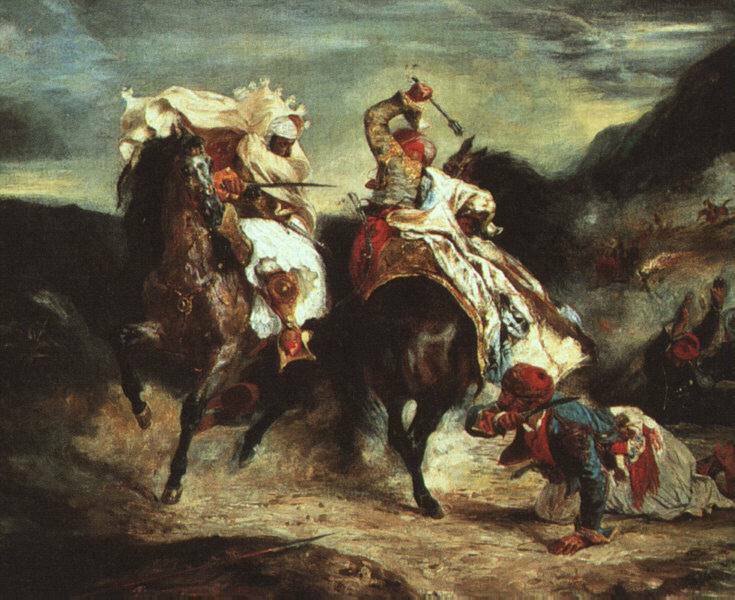 In 1832 Delacroix spent six months in Morocco at the court of Sultan Moulay Abd-er-Rahman. His impressions of the trip and the sketches he made during that year served as the basis for the numerous oriental works the artist created over the following quarter century. 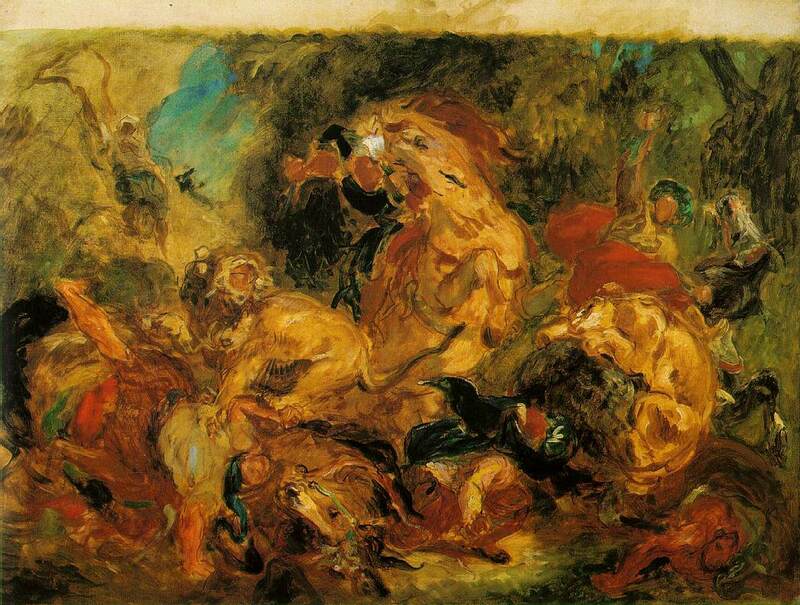 In his later years Delacroix devoted much time to writing in his famous journal and to painting monumental murals. In particular, from 1853 through 1861 he ornamented the Chapel of the Holy Angels in Saint-Sulpice, which brought him fame as the greatest colorist of the era.  Delacroix, the most vivid representative of French Romanticism, was the fourth child of Victoire Delacroix, wife of Charles Delacroix, Foreign Minister under the Directoire and Préfet of Bouches-du-Rhône (Marseilles). There is some reason to believe that his real father was Talleyrand [02 Feb 1754 – 17 May 1838], the famous diplomat, whom Eugène Delacroix resembled in character and appearance. 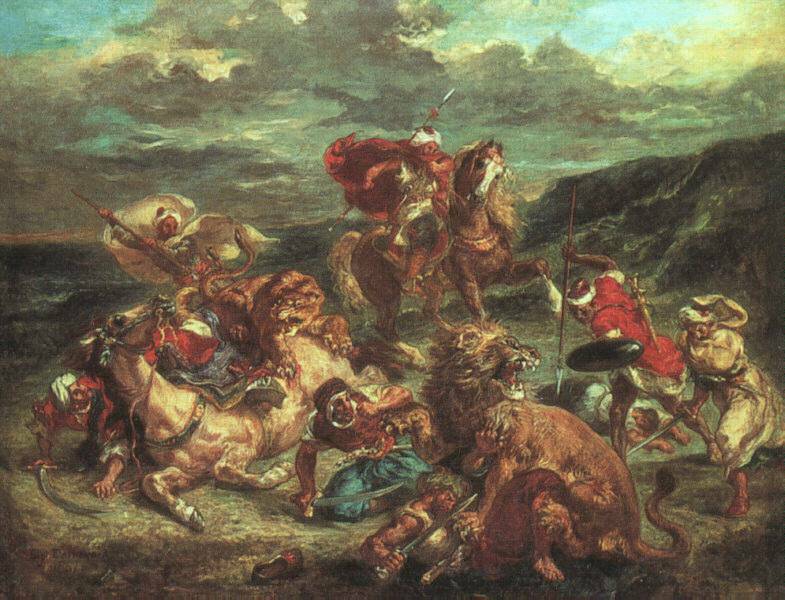 Charles Delacroix died in 1805; in 1814 Eugène�s mother followed, leaving him an orphan at the age of 16. In 1816 he entered l'École des Beaux-Art, where he befriended Bonington and Pierret. In 1822 his La Barque de Dante (189x242cm) was accepted for the Paris Salon, and subsequently acquired by the state (it would be smudgily imitated by Cézanne in 1870: La Barque de Dante, après Delacroix). 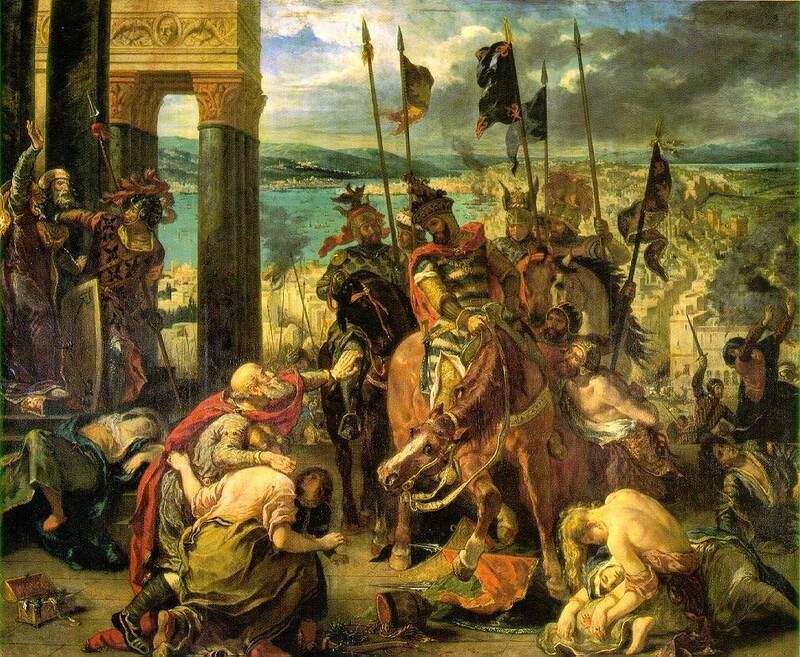 At the 1824 Salon Delacroix presented The Massacre of Chios (417x354cm -- here is a detail), a personal reaction to the genocide practiced by the Sublime Porte against the Greeks. 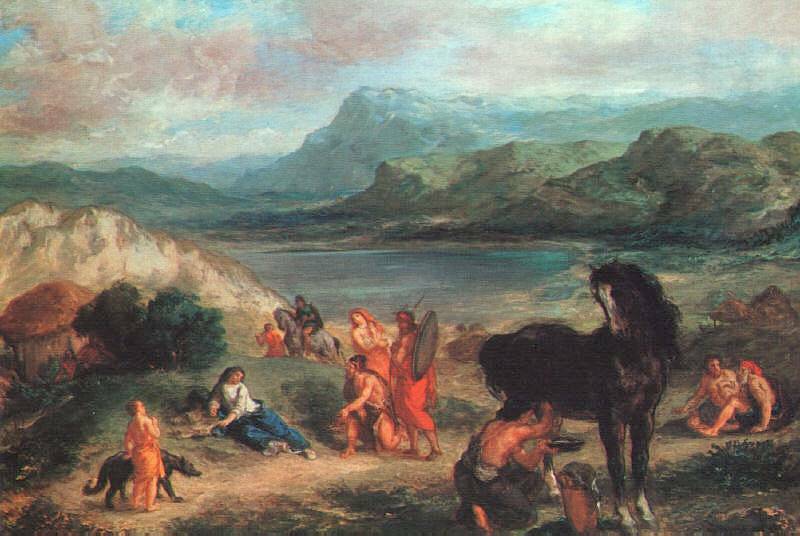 This work placed Delacroix firmly among the Romantic painters. Summer of 1825 he spent with Bonington in England, acquainting himself with English literature; made lithograph illustrations for Macbeth and Hamlet and heroes of Sir Walter Scott and Byron. In 1828 a series of 17 lithographs illustrating Goethe�s Faust was published. 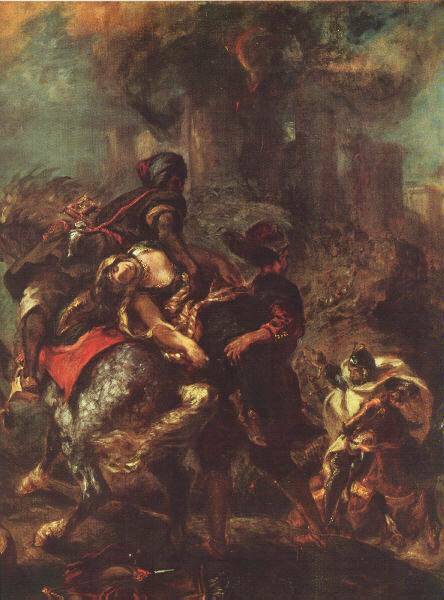 At the 1828 Salon Delacroix exhibited The Death of Sardanapalus and The Execution of Marino Faliero. In his Liberty Leading the People (28 July 1830) (260x325cm) Delacroix expressed his emotions and understanding of the July Revolution of 1830, and included his own self-portrait, holding a musket, in the first rank of the people in arms following Lady Liberty [image above]. 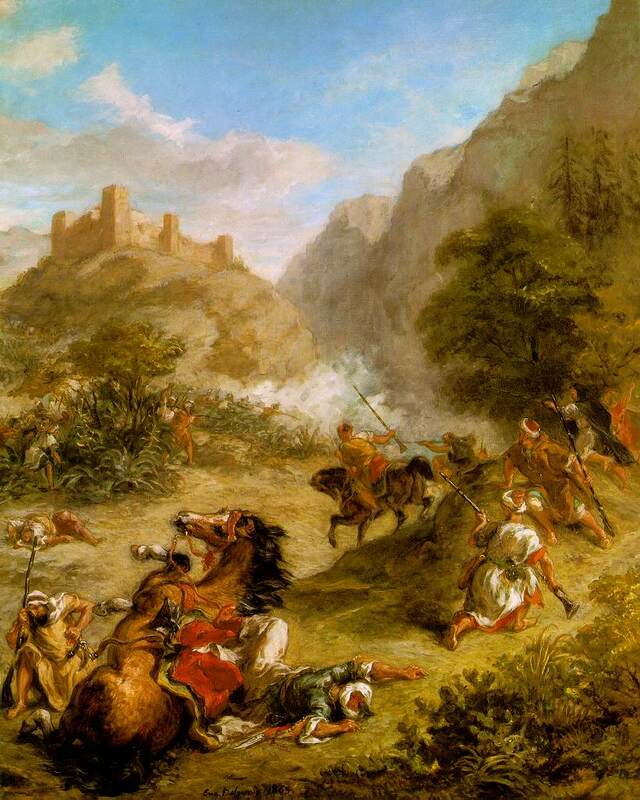 In 1832, Delacroix spent 6 months in North Africa, in the retinue of the Count Charles de Mornay, Ambassador to the Sultan of Morocco, abd er-Rugman. The life and customs of the Arabs fascinated him and were to inspire many paintings: The Fanatics of Tangier (1837-1838), The Sultan of Morocco and His Entourage (1845), The Lion Hunt in Morocco (1854), Arab Saddling His Horse (1855). In 1833-1837 Delacroix received many commissions for portraits, decorated the King's Chamber in the Palais Bourbon: Frescoes on the west wall (1833-1837). His Women of Algiers in Their Apartment (1834, 180x229cm) was a great success at the 1834 Salon. In 1838-1844 he decorated the library of the Chambre des Deputés and the Chambre des Pairs in the Palais du Luxembourg, as well as the Chapel of the Holy Sacrament at Saint-Denis; he continued to exhibit at the Salon; The Shipwreck of Don Juan (1840), Medea about to Kill Her Children (1838), The Entry of the Crusaders into Constantinople (1840). In 1850-1851 he decorated the ceiling of the Apollo Gallery in the Louvre: Apollo Slays Python (1850-1851). In 1855 he exhibited 48 paintings at the Universal Exposition in Paris. On his eighth attempt he was made a member of the Academy. His health worsened, he could no longer work and spent much time in the country. ^ In rendering homage to Michelangelo, Delacroix describes himself. The genius of Michelangelo is perhaps the closest kin to his own (in 1850, he imagined and painted Michelangelo in his Studio). Like Michelangelo, Delacroix inclines to terribilitas; his imagination too dwells on images of dread. From The Massacre of Chios to The Death of Sardanapalus, the tragic visions of Delacroix portray horrors unequalled even in the Sistine Chapel. Charles Baudelaire, an unconditional admirer, puts it thus in his Eugène Delacroix, Work and Life: Everywhere we see “ ... desolation, massacres and fire, everything testifies to the eternal and incorrigible barbarity of mankind. Smoke rises from cities razed to the ground, the throats of victims are cut, women are raped, and children hurled beneath horses' hooves or pierced by the daggers of their raving mothers; this entire corpus is a hymn in praise of suffering inevitable and unrelieved”. 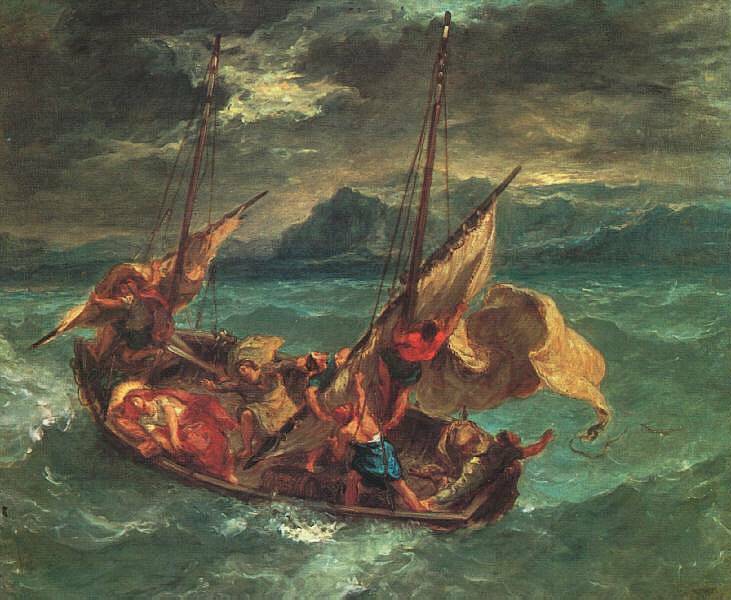 Though we trace Delacroix's artistic heritage directly back to Michelangelo and Rubens, in the matter of color there is a further influence, that of the Venetian school. Delacroix is a master of color, and his influence on Cezanne and Matisse is clear. In his own words: “The work of a painter who is not a colorist is illumination rather than painting. If one intends something other than cameos, color is, strictly speaking, one of the founding principles of painting, no less so than chiaroscuro, proportion and perspective... color gives the appearance of life." 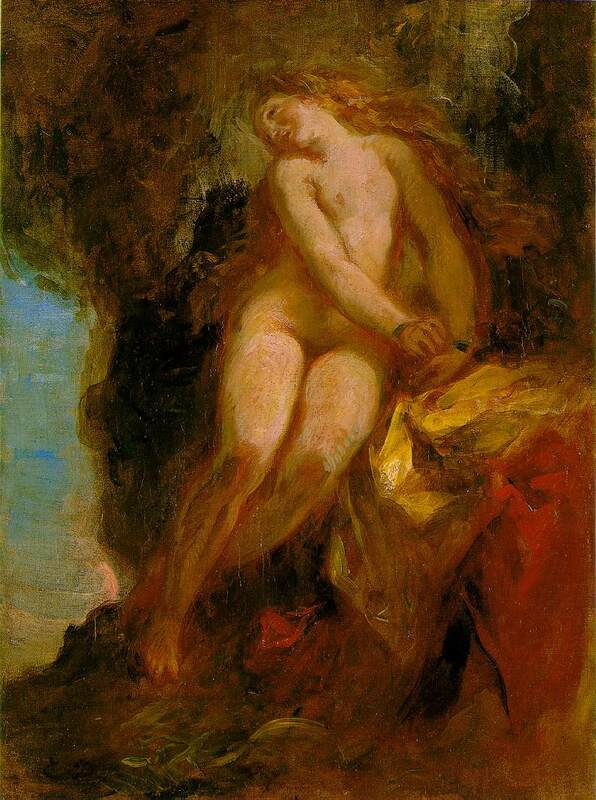 "As early as 1824, Stendhal had perceived in Delacroix "a student of Tintoretto”. In his Journal, Delacroix noted: "In Giorgione, Titian and their students, Venice possesses artists who perform miracles of color without any derogation from beauty." In Delacroix's words, "all the great problems of art were resolved in the 16th century"; perfection "in drawing, grace and composition" had been attained by Raphael, and in "color and chiaroscuro" by Correggio, Titian, and Paolo Veronese. Nonetheless, it was Rubens who, after Michelangelo, left the most profound mark upon Delacroix's art. Delacroix was overwhelmed. The affinity between the swirling dynamic vitality of Rubens and Delacroix's art is clear: "Then comes Rubens, who had already forgotten the traditions of simplicity and grace. He created a new ideal through sheer force of genius. Strength, striking effects and expressiveness are pushed to their limits." Delacroix perceived that, under the impetus of Rubens, a new epoch of art had opened up, an era of synthesis and equilibrium. On the one hand, there was the power, abundance, fiery dynamism, realism — and a certain penchant for Baroque eloquence and even effect. On the other, there was a nobility of conception and style. the paradigmatic harmony, sobriety and austerity of the Classical masters. 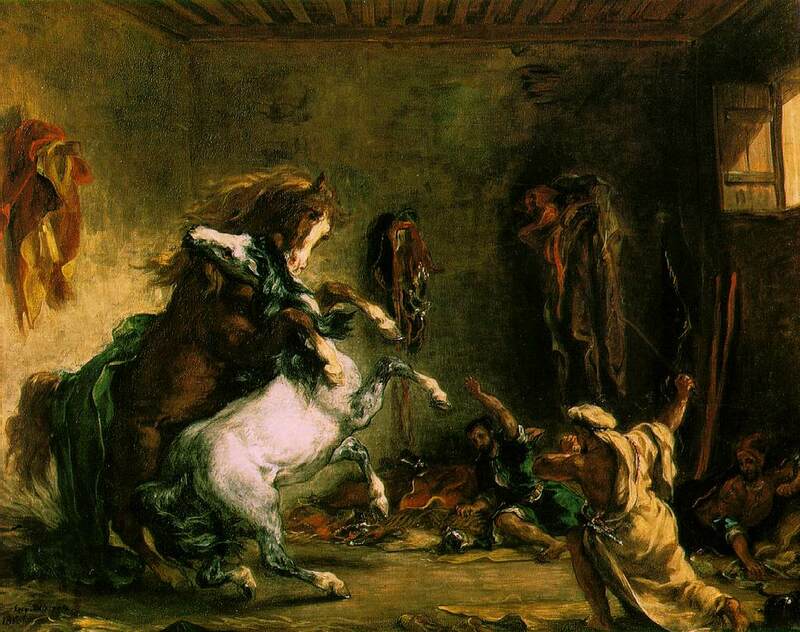 Thus Delacroix discovered himself through Rubens. In Rubens, his own errors found their vindication. They had been severely criticized by his contemporaries, especially in his large decorative compositions; but, as in Rubens, they are the work of a genius at once rational and impulsive, inventive and objective, visionary and realist. The superabundant life and decorative invention that typify the work of Rubens are present throughout Delacroix's career. To take just two examples, in The Death of Sardanapalus, the women butchered upon the pyre derive from the Nereids in Rubens' The Landing of Marie de' Medici' in Marseilles (1626, 394x293cm), which Delacroix repeatedly copied; and the Christ on the Cross (1845) was inspired by a detail in another Rubens masterpiece, Christ on the Cross (Le Coup de Lance) (1620). For Delacroix admired in Rubens a quality that he himself possessed in abundance: the ability to unite allegory and history, and mould into a tumultuous whole figures mythological, historical, literary and real. He too could convey the turbulent movement of brightly colored forms without disturbing the harmony of their arrangement and their overall composition in light and space. To understand Delacroix we must know not only the influences that left their mark upon him, but how he was able to assimilate these; how he made use of them to construct his own originality. This, in its turn, became his own legacy, and his own influence has been very widespread. The lesson that he teaches is clear. It is not enough to imitate the great masters, one must, instead, draw on them for inspiration as one seeks to transcend their achievement. — The students of Delacroix included L�on Joseph Florentin Bonnat [1833-1922] and Pierre C�cile Puvis de Chavannes [1824-1898]. �- Les Fanatiques de Tanger (1838; 877x1200pix, 103kb _ .ZOOM to 1462x2000pix, 287kb) _ Eug�ne Delacroix was the acknowledged master of the French Romantic school. In 1832, he traveled to North Africa with the French ambassador, Count de Mornay, who was to negotiate a treaty of friendship with the sultan of Morocco. One day in Tangier, the two hid in an attic and through the cracks of a shuttered window witnessed the frenzy of the A�ssaouas, a fanatical Muslim sect. The turmoil of that event is conveyed in this vividly colored and vigorously brushed depiction of the fanatics hurling themselves down the street. 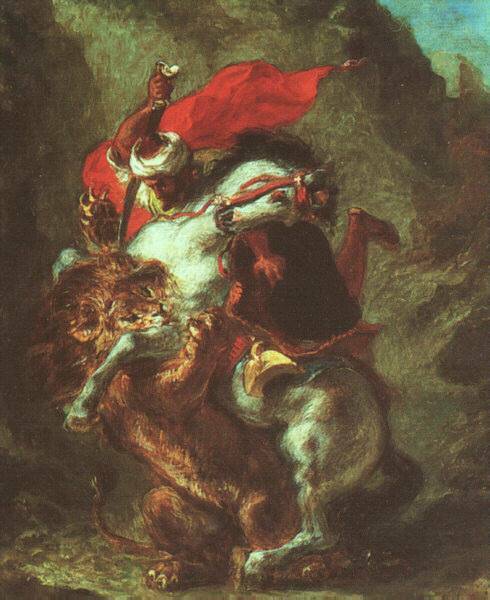 Of the pictures resulting from the Moroccan experiences, this remains one of Delacroix's most arresting. �- Murder of the Bishop of Liège (1829; 938x1191pix, 122kb _ .ZOOM to 1983x2518pix, 456kb) _ The bishop, who would be canonized as a martyr, is Albert, a son of Godfrey III, Count of Louvain, and brother of Henry I, Duke of Lorraine and Brabant. Albert was elected Bishop of Li�ge in 1191 by the suffrages of both people and cathedral chapter. But Emperor Henry VI, on the pretext that the election was doubtful, gave the see to his puppet Lothair of Hochstadt. Albert journeyed to Rome to appeal to Celestine III, who ordained him deacon, created him cardinal, and sent him away with gifts of great value and a letter of recommendation to the Archbishop of Rheims, where he was ordained priest and consecrated bishop. Outside that city, soon after, he was set upon by eight German knights of the Emperor's following, who took advantage of the confiding kindness of the saintly bishop, and stabbed him to death. The date of his martyrdom is given variously but 21 November 1192 is the most probable. Liège owes its existence as a city to the martyrdom of a predecessor of Saint Albert as Bishop: Saint Lambert, who had completed the conversion of the pagans in the region. The see of the diocese, since its creation after the first half of the fourth century, was at Tongres, northeast of Liège, which was only a small village named Vicus Leudicus. There, in 705 or thereabouts, Lambert was murdered, for his defense of church property against the avarice of the neighboring lords, and he was popularly regarded as a martyr. His successor, Saint Hubert, built, to enshrine his relics, a basilica which became the true nucleus of the city of Li�ge, and near which the residence of the bishops was fixed. �- Femmes à la Fontaine (760x900pix, 57kb) in North Africa; two women; also a dog barking at the young son of one of them, who is teasing it with a stick; in the background, a street with a rider accosted by a pedestrian, and a person sitting on the sidewark.  Studied under Daniel Seghers. His students included Abraham Mignon and Maria van Oosterwyck.  Dutch still-life painter. He was born at Utrecht and his rare early pictures are in the style of Balthasar van der Ast, who taught him there. Later he worked in Leiden and showed that he had studied the restrained and simple works of the Haarlem still-life artists Claesz. and Heda. In 1636 he moved to Antwerp, became a citizen of that city in 1637, and spent most of his very productive life there. The paintings he did in Flanders are the ones for which he is most renowned and are very different in spirit from his earlier works: splendid flower pieces and large compositions of exquisitely laid tables which breathe all the opulent exuberance of Flemish Baroque painting. His work formed a link between the Dutch and Flemish still-life traditions and he is claimed by both schools. He came from a large family of painters and his many followers in Flanders and Holland included his son Cornelis (1631-95).  Jan Davidszoon de Heem groeide op in Utrecht en was daar in de leer bij bloemstillevenschilder Balthasar van der Ast. In 1626 verhuisde de schilder naar Leiden, waar hij vooral monochrome stillevens met muziekinstrumenten en boeken ging schilderen. Na 1631 vertrok De Heem naar Antwerpen. In deze stad werd zijn werk steeds bonter en zwieriger. Hij veranderde ook van onderwerp en richtte zich op het weergeven van vruchten en bloemen. Hoewel De Heem vooral in Antwerpen woonde, verbleef hij toch nog regelmatig een periode in het noorden: in 1649 en tussen 1665 en 1672 was hij in Utrecht. Het werk van Jan Davidsz. de Heem was populair bij kopers en collega-kunstenaars. Hij had een groot aantal leerlingen en navolgers, onder wie Abraham Mignon. *** Een tros vruchten en bloemen is met een helder blauw lintje aan een koperen ring bevestigd. Het festoen hangt voor een donkere nis, zodat de frisse kleuren van het fruit mooi uitkomen. Alleen de gele citroen in het midden oogt iets minder fris. 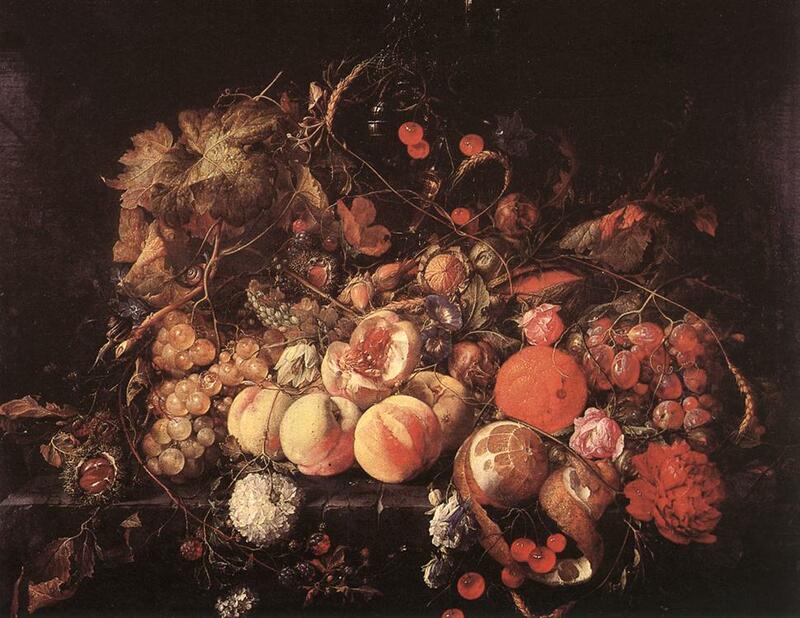 De Heem schilderde allerlei soorten fruit door elkaar, van exotisch citrusfruit en een granaatappel tot kersen, bramen en pruimen. Het schilderij oogt heel fris door de kristalheldere dauwdruppels die van de bladeren rollen. Insecten kruipen over het festoen en vliegen rond. Ze zijn z� tastbaar dat het lijkt alsof ze niet geschilderd zijn, maar leven en �p het doek zitten. Groene verf kan gemakkelijk verkleuren en wordt vaak een beetje vaal na verloop van tijd. Jan Davidsz. de Heem gebruikte een heel goed pigment voor de groene bladeren, zodat die nog steeds vers lijken. Jan Davidsz. de Heem overleed te Antwerpen tussen 14 oktober 1683 en 26 april 1684. — Fruit Still-Life with a Silver Beaker (46 x 65 cm, 580x820pix, 81kb; ZOOM to 884x1250pix, 182kb _ ZOOM+ to 1767x2500pix, 762kb) _ On a wooden table covered by a creased, green cloth the viewer sees an arrangement of crockery and fruits. A bare stonewall forms the tasteful background. The subject makes great demands of the painter�s skills since the objective of the work is to achieve a portrayal deceptive in its veracity. The sunlight takes on an important role as it plays with the varied optical characteristics of the objects. It glistens on the beaker while reflections illuminate the wine in the glass. At the same time, the velvety peaches absorb most of the light. The reflective drops of water on the grapes emphasise the impression of abundance and plasticity, while still apparently transparent. Heem moved to Antwerp because there one could have the rare fruits including all manner of large plums, peaches, apricots, sour oranges, lemons, grapes, and other, in better quality and ripeness, so as to reproduce them from life. As a harbor town living from foreign trade, Antwerp offered de Heem the possibility of perfecting his illusionist painting. This picture is an impressive example of his success.  Festoon of Fruit and Flowers (64x60cm) _ A bunch of fruit and flowers is tied to a bronze ring with a bright blue ribbon. This festoon is suspended in a dark recess beautifully setting off the fruit's fresh colours. Only the lemon in the middle looks less than fresh (because it was painted with orpiment, a yellow pigment which, when exposed to daylight, loses its bright yellow color, leaving a delicate, powdery surface). De Heem has painted various types of fruit in apparent random order, from exotic citrus and pomegranate to cherries, blackberries and plums. The painting has a fresh feel, thanks to the dewdrops rolling off the leaves. Insects creep across the festoon and fly around. They are so tangible that they seem more alive than painted and to have settled on the canvas. Some greens are faded to blue because they had some brown pink, a yellow pigment based on buckthorn or Avignon berries. In the Low Countries it was used from the 16th century in miniatures and oil paintings. The pigment tends to fade under direct sunlight. The ground for the festoon is built up of various layers. De Heem began with the rough grey underpainting of the fruit and flowers in dead color. He then embellished the objects further, occasionally leaving the underpainting uncovered. The painter described this technique: blue grapes and plums should consist of a reddish-brown underpainting covered by a dull bluish haze. This is how the grapes and plums, right, are painted. The grey ground is visible between them. The flowers and fruit in the festoon, particularly those in the foreground, are painted precisely and are well lit. Where they disappear into the background De Heem has employed a looser technique, enhancing the spatial effect. 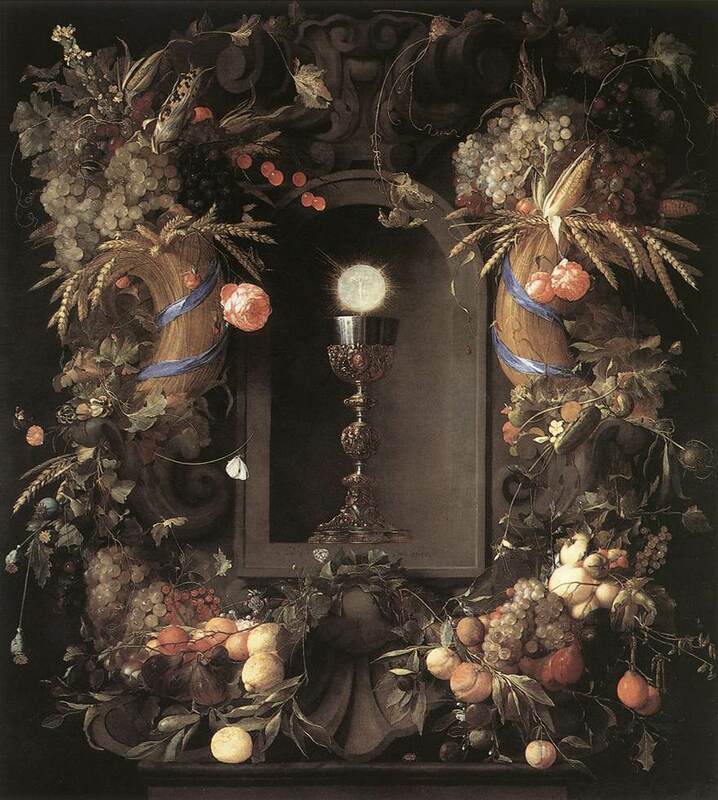  Eucharist in Fruit Wreath (1648, 138x125cm) _ Religious flower still-lifes are a special category, first developed by the Fleming Daniel Seghers, a student of Jan Brueghel the Elder. 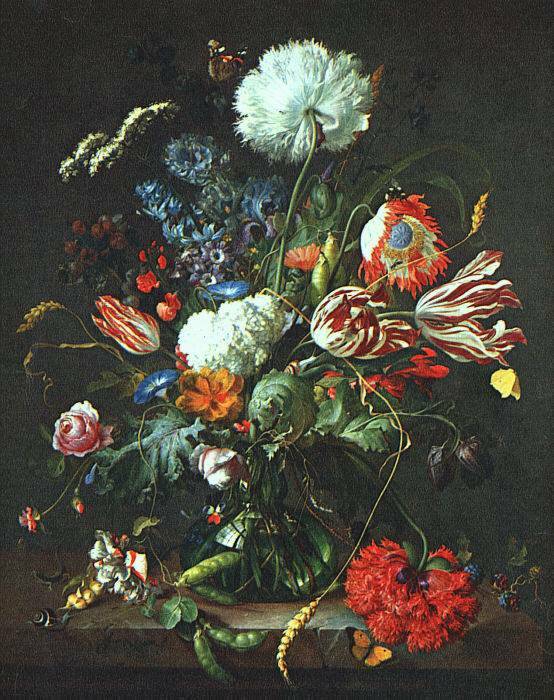 While Dutch paintings of flowers, particularly tulips, clearly showed a tendency towards secularization (with noticeable emphasis on the economic and aesthetic value of flowers rather than their religious significance, Seghers tried to recover their spiritual symbolism, in accordance with the counter-reformational aims the Jesuit order. Apart from the Virgin Mary, Seghers and his students had a preference for Eucharistic motifs. They particularly enjoyed painting arrangements of garlands around a niche in a wall in brown hues, showing a communion chalice with a host suspended above it. The host has a mysterious luminescent quality which emphasized the process of transubtantiation. This subject was painted especially frequently by de Heem, who was born in Utrecht but spent a considerable amount of time in Antwerp. Like Seghers, de Heem succeeded in adding a phosphorescent luminosity to his garlands, which also have an enamel-like clarity about them and richly colorful nuances. In his Eucharistic motifs they consist of fruit - particularly grapes - and bundles of grain, as well as apples, pears, figs and maize. The human eye can hardly appreciate the infinitely delicate precision of the tender, thread-like stems and little twigs winding around the jumble of the painstakingly detailed fruits. The Eucharist had a particularly prominent place in the Catholic Counter-Reformation, as a response to the Protestant doctrine that bread and wine merely had a symbolic value during communion.  Flower Still-life with Crucifix and Skull (1635, 103x85cm) _ De Heem, who was to win an international reputation as one of the greatest European still-life painters, spent time in Leiden. The most interesting works he painted during his stay there from the mid-twenties to the early thirties are vanitas still-lifes, mainly comprising piles of old, well-used books that signal the vanity of the scholarly life. 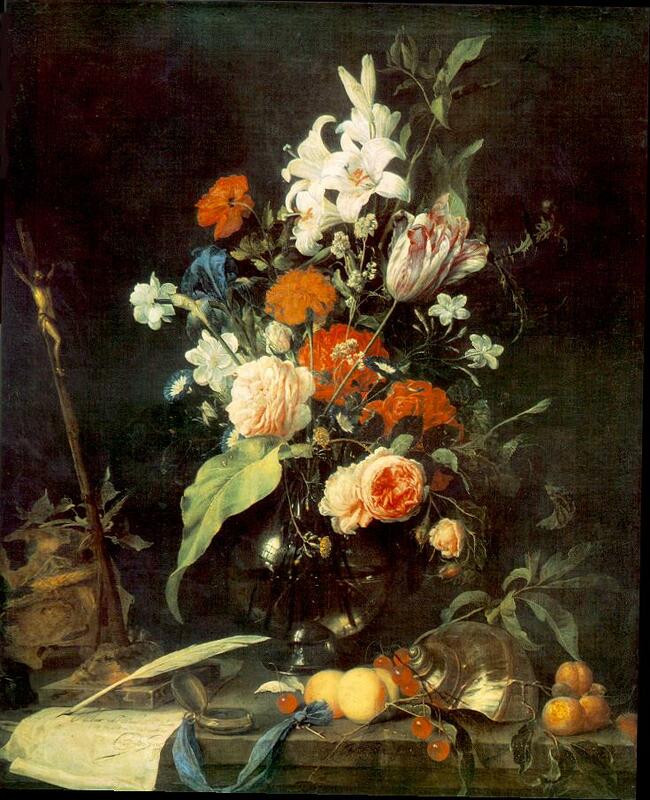 De Heem worked in other styles. His youthful pictures of flowers, fruit, and shells are in the manner of Balthasar van der Ast, and he also painted simple, restrained still-lifes which show his mastery of the chiaroscuro and the subtle tonal treatment of Claesz and Heda. This painting was painted and signed together with Nicolaes van Veerendael. Both painters worked in Utrecht and were specialized to flower still-life.  Fruits and Pieces of Sea _ De Heem's youthful pictures of flowers, fruit, and shells are in the manner of Balthasar van der Ast, and he also painted simple, restrained still-lifes which show his mastery of the chiaroscuro and the subtle tonal treatment of Claesz and Heda.  Still-life (56x74cm) _ De Heem's still-life paintings initially followed the style of the Haarlem school, but later drew closer to the more lavish Flemish style of large-scale still-lifes. Nevertheless, certain Dutch elements cannot be overlooked. In this painting, they are particularly evident at the points where a "dialectical principle" determines the compositional structure. A mass of fruit and flowers ranging from ripe chestnuts to blackberries, from columbine to roses, has been arranged on a stone slab. A wide variety of surfaces, each with a different effect in light, with pure or iridescent colors, is spread out before us. Yet snails are already crawling across the vine leaves, the foliage is discolored and withering and, the ears of grain are curling, the peach has burst its skin, the citrus fruit is half peeled, the white carnation is dried and drooping over the table edge. At the very point where the image bears an iconographic message of the transience of worldly life in the form of nature's riches, we see these things in their last bloom of beauty. Just as a ruin could represent the picturesque appeal of architecture, so too can a vine leaf riddled with snails seem picturesque in the full and final flowering of its beauty.  Still-Life with Fruit and Lobster (1649, 95x120cm) _ De Heem painted this still-life during his first Antwerp phase. 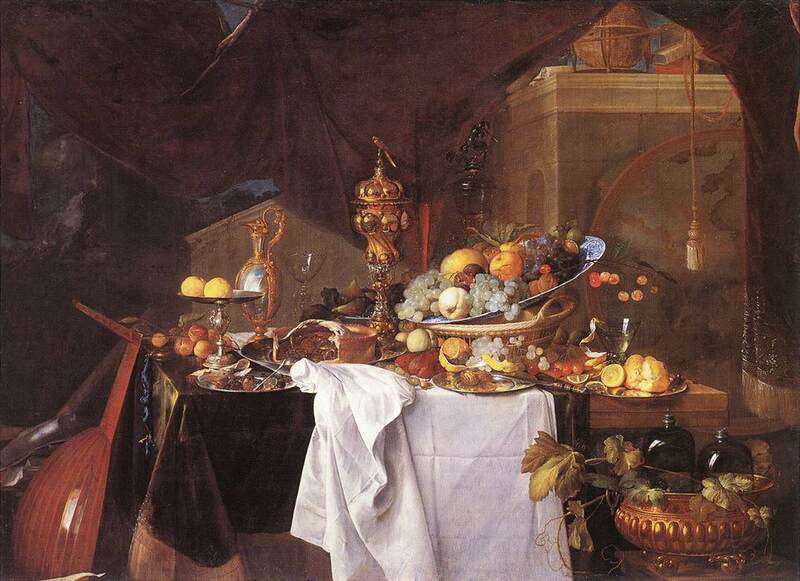 Compositionally, it is close to the ornamental still-lifes by Abraham van Beijeren of the early 1650s, who was no doubt influenced by de Heem, especially with regard to the terraced arrangement of the fruit, the mussels, the tableware and the jug. Unlike van Beijeren, however, de Heem's art scintillates with bright colors and an unsurpassable attention to detail. Influenced by the Jesuit artist Daniel Seghers, de Heem frequently incorporated hidden religious symbolism in his paintings. 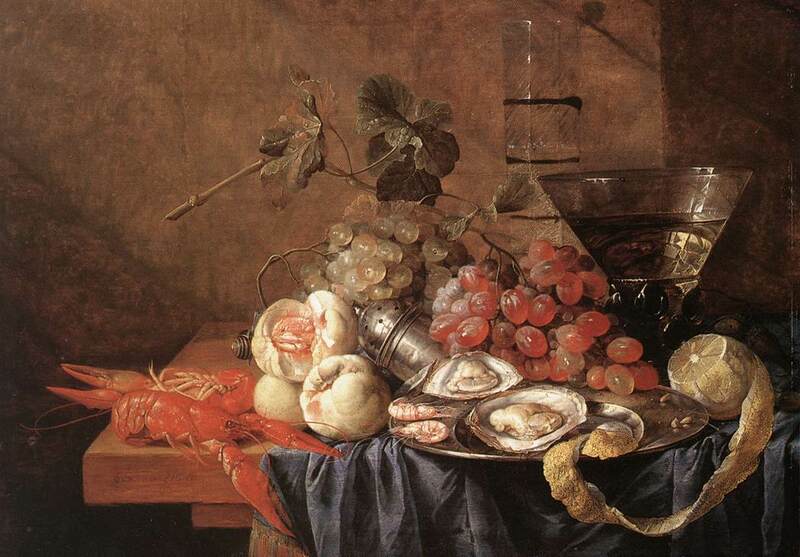 In this still-life, for example, the mussel and the lobster are allusions to the resurrection, and are related to the 'Eucharistic' grapes.  Still-Life with Fruit, Flowers, Glasses and Lobster (1665, 87x72cm) _ On the edge of a niche, half covered by a bronze-colored velvet cloth with a fringed edge, a large number of objects are presented in a highly studied fashion in such a way as to maximise the volume, color and texture of each individual item and to produce sensuous contrasts: a luxuriant still-life that is a feast for the eyes. The base of the composition is formed by a Wanli egg-shell china bowl with fruits. We can make out an orange, a half peeled lemon, apricots, white and purple grapes, medlars and plums. To the right a lobster, flanked by peaches and apricots on a raw wood box. To the left a simple round box serves as a base for a half filled rummer. The presence of an elegant fluted glass, providing the top of the composition, is indicated solely by the light reflected on the narrow top. A third, bowl-shaped glass stands  scarcely visible  between the fluted glass and the lobster. A small collection of flowers - roses, a carnation, violets - forms a colorful point of light and a visual counterweight to the dominating red lobster to the left of the bowl. The visual gaps are filled and a lighter accent is added with smaller fruit, creepers, twigs, blades and insects: we see blackberries, medlars, hazelnuts, acorns, cherries, a bumble bee, caterpillars, butterflies and a dragonfly. In the composition a number of ovals are enclosed in a triangle, which in turn is literally rounded off by the arch of the niche. A large diagonal traverses the whole ensemble, ending on the lower left on the lid of the reed basket. To the right of it, vine tendrils curl over the edge of a copper wine cooler. For more than a hundred years this work of art was catalogued as being by Jan Davidsz. de Heem. Despite the undoubted quality of the piece, sealed with the master's name on the top left corner, a detailed stylistic investigation and a closer analysis of the signature by De Heem expert Fred G. Meijer have cast justified doubt on the true author. Recently a canvas from the Joseph Verner Reed collection was designated by him as the prototype for this and other, already known variants. Who painted this version remains for the time being an intriguing question: we do not immediately know any figure in De Heem's immediate and wider circle to whom to attribute this painting exploit.  A Table of Desserts (1640, 149x203cm) _ Jan Davidsz de Heem, who was to win an international reputation as one of the greatest European still-life painters, also spent time in Leiden. The most interesting works he painted during his stay there from the mid-twenties to the early thirties are vanitas still-lifes, mainly comprising piles of old, well-used books that signal the vanity of the scholarly life. In about 1635 he moved to Antwerp and in 1637 became a citizen of the city. Apart from some trips to Utrecht, his native city, he remained active in Antwerp for two decades and then is registered there as a non-resident citizen. His long stay in Antwerp earns him a place in the history of Flemish as well as Dutch art. By the late 1660s de Heem settled in Utrecht where he lived until 1672, the disastrous year that Louis XIV's armies invaded the Netherlands. Then he returned to Antwerp where he was active until his death. According to Sandrart (1675) he left Utrecht for Antwerp because 'there one could have rare fruit of all kinds, large plums, peaches, cherries, oranges, lemons, grapes, and others in finer condition and state of ripeness to draw from life ...' The reason Sandrart offers for his move can be questioned. Is it not possible that de Heem fled to Antwerp to avoid living under the invading French troops? It was during his first years in Antwerp that de Heem found his special province. There he painted his famous flower pieces which occasionally have overt moralizing messages. In Antwerp he made contact with the Flemish Jesuit Daniel Seghers (1590-1661), who, after Jan Brueghel, was the most accomplished south Netherlandish flower painter of the century. Seghers depicted bouquets but his speciality was painting garlands encircling a cartouche with a religious scene, a sculptural image, or a portrait, frequently painted by another artist. De Heem adapted Seghers's cartouche motif and painted hanging garlands as well. The individual blooms in these works are as colorful and as accurately portrayed as Bosschaert's, but they are done with a freer brush, introduce chiaroscuro effects, and have asymmetrical arrangements. The host of de Heem's followers and later flower painters use similar pictorial devices. 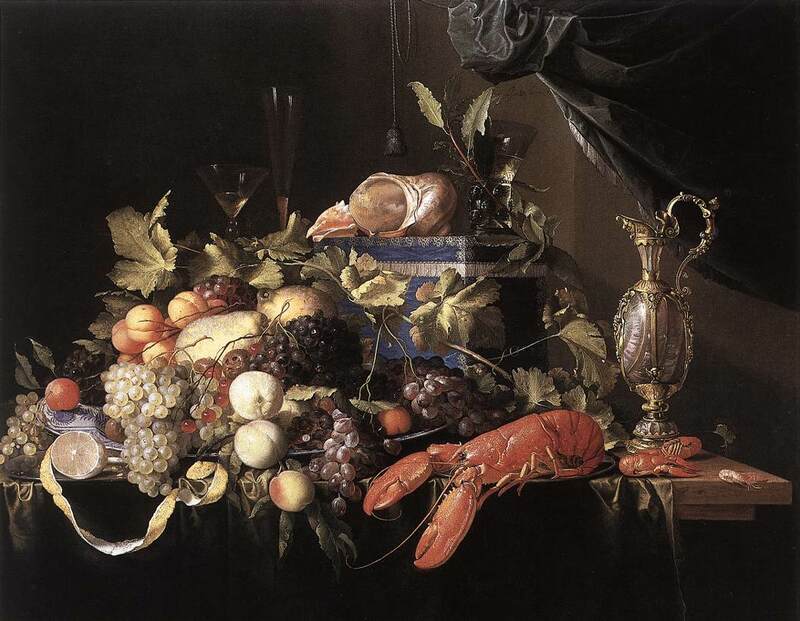 In Antwerp de Heem also began to paint his celebrated abundant displays on carpet-covered tables piled high with ornate silver platters and baskets of huge, expensive fruit, and glistening lobsters. These works are usually embellished with exquisite trappings, precious metal vessels, and delicate glassware. An outstanding very large, early one at the Louvre (this picture) was in the collection of Louis XIV before 1683. The Dutch call lavish still-lifes of this type 'pronk stilleven' (pronk means sumptuous or ostentatious). The term is traditionally used to categorize overt displays of magnificent banquets and luxury items painted from the mid- to the late decades of the century. 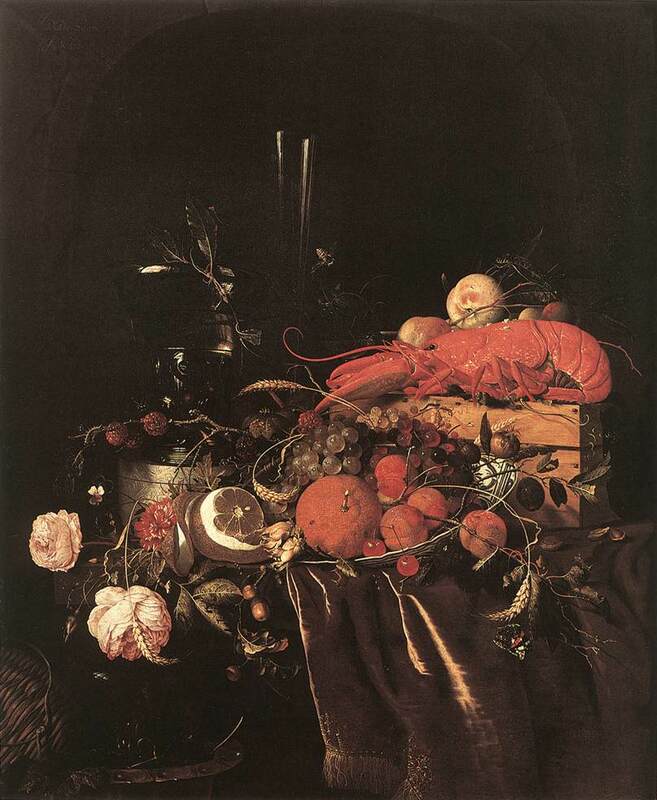 De Heem, Willem Kalf, and Abraham van Beyeren were the leading practitioners of the type. Their patrons presumably belonged to the upper echelons of society and made no secret of their expensive tastes. De Heem is one of the rare Dutch artists who captured some of the exuberance of Flemish Baroque painting, and soon after he settled in Antwerp in the 1630s his coloristic splendor rivals that of the native Flemings. The success of his flower pieces and pronk still-lifes won him many students and imitators both in Flanders and in the northern Netherlands, and occasionally it is difficult to separate his hand from works done by his followers. His son Cornelis de Heem [1631-1695] can come dangerously close to his father. De Heem's works were also frequently copied during the eighteenth and nineteenth centuries. As late as 1893 Matisse made a close reduced copy (Nice-Cimioz, Mus�e Matisse) after the large composition in the Louvre. He sold the copy, then bought it back and used it as an inspiration for his Variation on a Still Life by de Heem (1915) which is about the size of the huge original. Though Matisse's Variation on de Heem still shows an unmistakable debt to the Dutch painter's composition, it has been completely translated into his personal style of these years.  Vase of Flowers (1645, 70x57cm) _ Gardening and the breeding of beautiful hybrids satisfied the Dutch interest in art and in science. Exotic flowers also indicated their far-flung explorations and their expertise in botany. In fact, a �tulip-mania� swept Holland soon after tulips were imported from Turkey in the 1550s. In 1637, Amsterdam�s commodity market in tulip bulbs crashed, causing capitalism�s first depression. The thirty-one species of plants in this vase cannot bloom in the same season. Many of these blossoms have emblematic meanings. The upper flowers thrive in the sunshine that streams through De Heem�s studio windows to be reflected in the crystal vase. The lower plants, farther away from the light of heaven, droop and wilt. Near the bottom, a salamander stares hungrily at a spider, while a snail, moth, and ants crawl on the marble shelf. All these creatures symbolize night and decay. On the white poppy at the top, a caterpillar and butterfly evoke the idea of rebirth from a cocoon or tomb. De Heem spent most of his career in Antwerp in Flanders. Colorful extravagance, typical of Flemish taste, imbues his still lifes, and De Heem passed this opulence on to his followers, including Abraham Mignon. 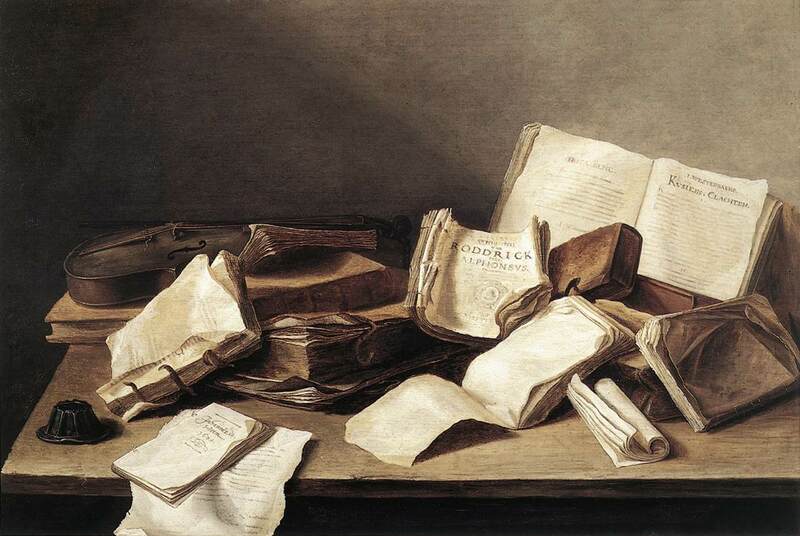  Still-Life of Books (1628, 36x46cm) _ In Leiden, the southern Dutch university town with a renowned university founded in 1577, the university was already equipped with a large library by the 17th century. De Heem worked in Leiden between 1626 and 1636 and he specialized in still-lifes of books during that time. 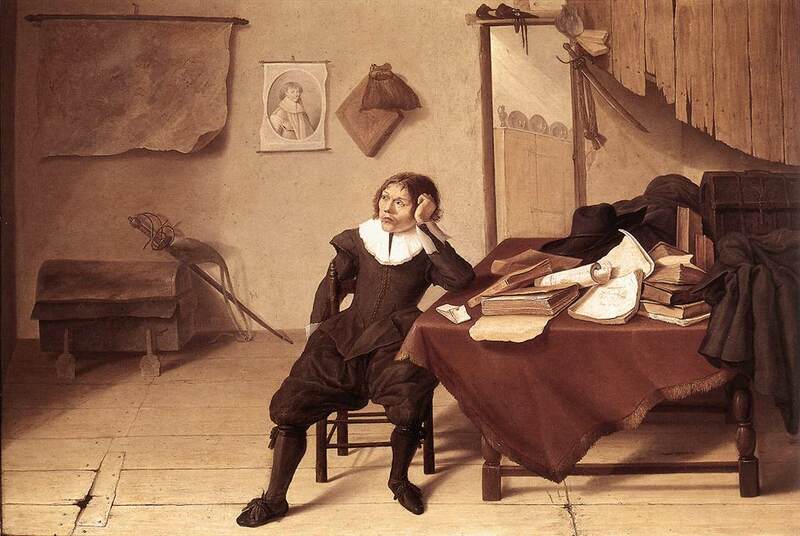  Student in his Study (1628, 60x81cm) _ In the room a student is shown with a melancholy expression on his face, head in hand, thinking about the contents of the books strewn across his desk. ^ Born on 26 April (August?) 1882: Édouard-Léon Cortès, French painter who died in 1969. — Cort�s was born in Lagny. During his early lifetime, Paris was the center of the art world. Artists from across the globe traveled there to study and paint it�s beautiful countryside and cities; views of Paris, the City of Lights, were in great demand by both collectors and tourists. �douard Cort�s, along with other artists like: Eugene Galien-Laloue [1854-1941], Luigi Loir [1845-1916] and Jean Beraud [1849-1936] answered their call. Specializing in Paris street scenes, each of these artists captured the city during its heyday and continued with these scenes well into the 20th century. �douard was the son of Spanish Court painter Antonio Cortés, who was the son of the artisan Andr�s Cortés. Antonio was born in Seville in 1827 and established himself as a painter of rural genre. In 1855 he went to Paris for the Exposition Universelle and was drawn to the town of Lagny-sur-Marne, where he settled. He continued to paint scenes reminiscent of Troyon, Jacque and Van Marcke. Antonio had three children — �douard, Henri and Jeanne — and while all had artistic talent, it was �douard who had the passion. Antonio began teaching �douard at an early age and enrolled him in a private elementary school where he continued his schooling until the age of 13. From this point on he devoted his life to art, working and studying with both his father and older brother. In 1899, at the age of 16, he exhibited his first work,Le Labour, at the Soci�t� des Artistes Fran�ais. The work was well received by the critics and the public - helping establish �douard�s favorable reputation in Paris. It was at the turn of the century that he began to paint the scenes that he would become most famous for — Paris� streets and monuments. One of the more prolific artists of his time, Cort�s found his niche and stayed with it. His views of Paris are among the most telling and beautiful images of this genre; capturing the city during all it�s seasons for more than 60 years. �douard married Fernande Joyeuse in 1914 and had a child, Jacqueline Simone, in 1916. Fernande died in 1918 and shortly thereafter �douard decided to marry his sister-in-law Lucienne Joyeuse. They settled in Paris and Édouard continued to paint views of Paris. By the mid 1920�s, Edouard and his family moved back to Lagny (in Normandy) and he began painting scenes of country life - including landscapes, interior scenes and still lives. He was an active member of the Union des Beaux-Arts de Lagny and was the Union's first president. Their inaugural exhibition was held in 1927 and Cort�s continued to exhibit there until the late 1930�s. During this period he received many awards, gained great notoriety and was a frequent exhibitor at the exhibition halls in Paris, including the Salon d�Automne, Salon d�Hiver, Salon de la Soci�t� Nationale de l�Horticulture and Salon des Ind�pendants. Cort�s and his family spent World War II in Cormelles-le-Royal , Normandy, distancing themselves from the cities, which suffered the most from the German Nazi occupation of France. By the early 1950�s he had relocated to Lagny, where he would remain for the rest of his life. His beautiful depictions of Paris were always in demand and he continued to paint them until his death. Much less known than Cort�s� Parisian Street scenes, are his many landscapes and interiors in Normandy and Brittany. In 1925 he and his family moved back to Lagny, the small town, just east of Paris, where he was born and grew up. Lagny had a rich, artistic heritage and was an area visited by many artists seeking inspiration, including Lebasque, Luce, and Pissarro. It was after Cortès's return to Lagny that he became active in the Union des Beaux-Arts de Lagny and was elected its first president. The Union�s first exhibition was held in 1927 and Cort�s continued to exhibit there until the late 1930�s. Cort�s also set up a second studio in Ouistreham, Normandy, during this period. These Realist works, painted from 1925 to 1945, capture the simple and quiet life of the countryside. They are tranquil and often feature a few figures going about their daily life. Like his Paris street scenes, these painting are created with impressionistic brushstrokes and bright colors; even when he paints his evening scenes, Cort�s always adds a few of his signature colors — red, yellow and blue — in a window, shop sign or gas lantern. _ .Bouquinistes de Notre-Dame (33x46cm; 600x845pix, 78kb, .ZOOM to 1200x1690pix, 177kb), differs only in minor details, such as having a browser in the foreground and more fallen leaves. _ Bouquinistes de Notre-Dame (33x46cm; 774x1000pix, 106kb), differs somewhat more, most noticeably by the absence of the nearest display of books and art prints. — Marché aux Fleurs à la Madeleine (33x46cm; 727x1000pix, 211kb) and the almost identical Marché aux Fleurs à la Madeleine (33x46cm; 737x1000pix, 1107kb) with the same stalls, but different strollers and arrangement of flowers. — Omnibus sur la Place de la Madeleine (46x53cm) _ not very different from the preceding pictures, except that this one is before the introduction of the horseless carriage. — La Madeleine vue de la Rue Royale (33x46cm) _ before the horseless carriage. — Rue Royale, Concorde (33x46cm) _ featuring an omnibus pulled by horses, as in the previous two pictures. — Métro George V (33x46cm) _ The metro entrance is a minor part of the picture, which shows the Champs-Elysées avenue with the Arc de Triomphe in the background and, as usual with Cortès, it is just after a rain which has left the pavement wet and shiny. — L�Arc de Triomphe (33x46cm; 440x600pix, 56kb) _ L'Arc de Triomphe, Place de l'Étoile (1959, 33x46cm; 650x912pix, 572kb) _ L�Arc de Triomphe, Hiver (33x46cm; 600x831pix, 520kb) _ all three images almost identical, with snow on trees and on the ground, melted enough on the pavement to reflect the headlight of a streetcar. — L�Arc de Triomphe (33x46cm; 750x1047pix, 693kb) _ similar to the preceding three, but with more modern clothes and vehicles, and, instead of snow, the ground very wet from a recent rain. — Soir de Neige (33x46cm; 426x600pix, 111kb) and Soir d�Hiver (33x46cm; 430x600pix, 262kb) _ almost mirror images of each other; in a village under snow. — Paris, Place de la République _ with snow. — Interieur Familial (46x33cm; 741x528pix, 388kb) _ Famille le soir � la veill�e (46x33cm; 750x536pix, 389kb) _ Famille Bretonne (33x46cm; 750x1044pix, 602kb) _ the three images are similar.  John James Audubon was born in Les Cayes, Santo Domingo (now Haiti), the illegitimate son of French sea captain Jean Audubon and a servant, Jeanne Rabine. In 1789, a few years after the death of his mother, he was taken to France and raised by his father and stepmother. During a happy childhood at Coueron, near Nantes, he studied geography, fencing, and mathematics, but was most enthusiastic about exploring the out-of-doors and collecting and drawing birds' nests, eggs, and other curiosities. Audubon claimed to have studied with the French neo-classical painter Jacques-Louis David, but there is no documentation to support this. In 1803 he was sent to the US to operate Mill Grove, a farm near Philadelphia that his father had purchased in 1789. Through mismanagement and neglect Audubon lost the farm, thus beginning a long series of early commercial failures for the young man, who preferred to devote his time to shooting and sketching specimens rather than to overseeing his business interests. At Mill Grove, Audubon met Lucy Bakewell, whom he married in 1808. They moved to Louisville, Kentucky, then to Henderson, Kentucky, and in later years to New Orleans. Because he was often absent on collecting excursions, his wife worked as a governess and schoolteacher to support the family. In 1819 Audubon was briefly jailed for debt. About this time he began to earn a living making likenesses in chalk, which he continued to do until 1826. He also worked as a taxidermist in Cincinnati in 1820. Although he had met Alexander Wilson [1766-1813] in 1810 and had seen Wilson's great work American Ornithology, it was not until ten years later that Audubon arrived at the idea of publishing his own illustrations of birds and began collecting and drawing specifically toward that end. With his assistant Joseph Mason, a young artist specializing in plants and insects, he journeyed from Cincinnati to New Orleans and Natchez. In 1822 Audubon took lessons in oil painting from an itinerant artist named John Stein (or Steen). This is his only recorded training in this medium. He had been working primarily in pastels, but about this time he began increasingly to use watercolors. Audubon visited Philadelphia in 1824 and arranged to show his work at the Academy of Natural Sciences. He won no sponsorship in that city, however, because of his rough manner and the threat his project posed to the work of the favored Alexander Wilson. In 1826 Audubon turned to England to gain support for his venture. He found a warm and encouraging reception in Liverpool, where he showed his drawings and paintings at the Royal Institution. Gradually he gathered a group of subscribers and found an accomplished London engraving firm, Robert Havell & Son, thus enabling him to begin his project of creating large (double elephant folio) illustrations of American birds. Audubon traveled back and forth between the United States and England a number of times over the next several years to secure specimens and financing for his production. He was assisted by his sons John Woodhouse, who accompanied him on collecting trips, and Victor Gifford (1809-1860), who supervised the marketing and printing of the plates in London. The Birds of America was issued in 87 parts of 5 plates each and when completed in June 1838 contained 435 hand-colored engravings of 1065 birds of 489 species. Accustomed to seeing specimens shown simply, against a blank background, some naturalists objected to Audubon's use of dramatic poses and settings. Indeed, Audubon was sometimes guilty of endowing the creatures he depicted with almost human attitudes. Yet his attempt to position them as he thought they moved in the wild, using wire armatures to support the freshly-killed subjects, was truly revolutionary. Today The Birds of America engravings and the brilliant watercolors upon which they are based are admired not only for their ornithological exactness, but also for their vitality and keen sense of design. Even while Audubon was producing his visual record of American birds, he was documenting their characteristics and his own experiences in the wilderness in his Ornithological Biography, published in five volumes between 1831 and 1839. By this time he had become a celebrated figure in the United States, appearing in the press, lecturing to the public, and mingling with important people such as President Andrew Jackson. He was encouraged to undertake two new publications. The first was a version of The Birds of America comprised of reduced-size illustrations, lithographs rather than engravings, printed 1839 to 1843. The second was The Viviparous Quadrupeds of North America (printed 1845-1848), two volumes of handcolored lithographs based on watercolors by John James Audubon and his son John Woodhouse Audubon and accompanied by text written by their friend, the amateur naturalist, the Reverend John Bachman. Both of these efforts were very successful and allowed the artist to retire in comfort. Audubon's last nine years were spent at Minnie's Land, 14 hectares of property that he purchased on what is now upper Manhattan, facing the Hudson River. He died there. — Audubon was born in the French colony of Santo Domingo (now Haiti), the son of Captain Jean Audubon, a French sailor and adventurer, and one of his mistresses, Jeanne Rabine, a French chambermaid, who died six months later. Beginning at the age of three he was raised by his father and an indulgent stepmother in Nantes, France. Young Audubon acquired the graces of a country gentleman, received a bit of naval training, learned to love nature and wildlife, and began to draw. To escape conscription into Napoleon's army, Audubon was sent to the US in 1803 to oversee his father's farm, Mill Grove, in Montgomery County, 40 km northwest of Philadelphia. (The settlement near Mill Grove, once known as Shannonville, was christened Audubon in 1899.) Captain Audubon had purchased 115 hectares in 1789 as an investment, perhaps in the hope — albeit unfulfilled — that a lead mine on the property would prove lucrative. He never set foot on the land, but his son's stay, even though it lasted less than three years, was probably the happiest period of the young man's life and would prove pivotal to his career. The centerpiece of Mill Grove was-- and remains-- a substantial stone farm-house, built in 1762 by James Morgan, situated on a gentle slope above the wide Perkiomen Creek, a tributary of the Schuylkill River. Although basically a farm managed by a tenant farmer, the estate contained forest lands, a mill, and mineral deposits. With few responsibilities at Mill Grove, Audubon's life was carefree. "Hunting, fishing, drawing, and music," he wrote, "occupied my every moment," as did swimming and the local social life. The young dandy's grace as a dancer and prowess in ice skating were the talk of local residents. "Not a ball, a skating match, a house or a riding party took place without me," he recalled. At the time, Audubon later boasted, he possessed "erect stature" and "muscles of steel." Audubon quickly fell in love with the eastern Pennsylvania countryside and its animals, often roaming the woods and fields incongruously wearing satin breeches and silk stockings. He became an enthusiastic and skilled hunter, both for sport and for his art. He collected all kinds of wildlife specimens, which he both preserved and sketched in attic rooms at Mill Grove. In a little cave on the banks of the Perkiomen Creek, Audubon conducted the first bird banding in America. Tying silver threads to the legs of phoebes or pewees, he discovered that they returned during the spring migration-- just as they do to this very day. He also developed techniques for passing wires through freshly killed birds to fix them in characteristic poses on which he based his life-like sketches. He wrote that he had "shot the first Kingfisher I met," wired the body so that "there stood before me the real Kingfisher," and proceeded to execute "what I shall call my first drawing actually from nature." This innovative wiring process, on which he relied throughout his career, enabled Audubon to depict birds in animated and realistic postures, in contrast to the stiff and static images of his predecessors, who drew upon stuffed specimens. At the age of twenty, Audubon spent a year with his family in France, where he pictured birds in pastel. He also gained his father's approval to marry Lucy Bakewell, daughter of William Bakewell, an Englishman who owned Fatland Ford, an estate adjoining Mill Grove. After their marriage in 1808, Lucy Bakewell Audubon was a tower of strength, supporting her peripatetic husband in times of trouble and travail, remaining at home to raise their two sons, victor Gifford Audumon and John Woodhouse Audubon [1812-1862], and working intermittently as a teacher while he traveled about as portrait painter, music and fencing instructor and, eventually, painter of the birds of the US. "Immediately upon my landing" in the US in 1806, he later wrote, "prompted by an innate desire to acquire a thorough knowledge of the birds of this happy country," Audubon resolved to devote his spare time to drawing each US bird in "its natural size and coloring." Meanwhile, discouraged by disputes with partners and the failure of the lead mine on the property, Audubon sold Mill Grove and moved to Kentucky to seek his fortune as a frontier merchant. He was joined by his wife not long afterward. Audubon found the wonders of Kentucky so compelling that he often neglected his store. After several commercial ventures failed-- partly because he roamed the woods making sketches-- he faced bankruptcy in 1819. For a time he eked out a living as an itinerant portrait painter and worked briefly as a taxidermist in Cincinnati, Ohio. But at the age of thirty-five, John James Audubon decided to turn passion into profession, audaciously setting out to depict every bird in the US, with an eye to publishing the results. It was a remarkable undertaking for a newcomer with no formal art training, untutored in science, struggling with an unfamiliar language, having few friends, being husband and father, and possessing little money. Only a man of prodigious energy, ambition, determination, and patience, augmented with a knowledge of nature and artistic genius, could have matched his achievements. Audubon's house in Montgomery County, depicted by Thomas Birch's circa 1820 Mill Grove Farm, Perkiomen Creek, Pennsylvania. His bird portraits are prized for their realism. In the United States, Audubon's monumental project was preceded by the work of several bird illustrators, notably Scotsman Alexander Wilson [1766-1813]. Wilson settled in Kingsessing, on the outskirts of the City of Philadelphia, and enjoyed the encouragement of the city's influential scientific and intellectual community. A poet, self-trained artist, and naturalist, Wilson traveled widely, collecting specimens and making drawings but used stuffed birds as models. He and Audubon crossed paths twice: first at Audubon's store in Louisville, Kentucky, in 1810, a meeting which may have inspired Audubon to prepare his own books of bird images, and again in Philadelphia two years later. Alexander Wilson's pictures appeared in nine handsome volumes, American Ornithology, published between 1808 and 1814, with clear plates and accurate, but rigid and static likenesses, accompanied by graceful text. It was a considerable accomplishment for a man with few resources other than his own ability and enterprise, but it was soon eclipsed by Audubon's work. Launching his full-time pursuit of North America's birds in 1820, Audubon wanted knowledge of his subjects in their habitats. For two decades, in all kinds of weather and in all seasons, he roamed mountains and valleys, everglades and uplands, and lakes and rivers, from Canada to the Gulf of Mexico. He traveled the lengths of the Ohio and Mississippi Rivers and up the Missouri to Yellowstone. He explored the Atlantic coast from the Dry Tortugas to Labrador, and the Gulf coast from Florida to Texas. Working extremely long hours under trying conditions, he labored tirelessly on his great project. Because he was familiar with the activities of his subjects and used freshly killed birds wired in his unique manner, Audubon was able to capture the shapes, textures, plumage, colors, and typical positions of his birds more accurately than other artists. Many believe that, in spite of the advantages of photography and state-of-the-art technology, no modern bird painter has equaled his achievements. Skilled at depictions in pastel and pencil, Audubon gradually added to his repertoire a variety of techniques incorporating watercolor, gouache, and glazes. He often blended several media in one image to faithfully replicate the look of his subjects. Although collectively characterized as "watercolors," his mature works are much more. Background plants and landscapes for many of the bird portraits were painted by talented assistants who often accompanied him on his travels. The evolution of Audubon's art is unwittingly documented by Northern Goshawk and Cooper's Hawk, part of which was completed in 1809, part in 1830. The cooper's hawk in the lower right and the adult northern goshawk in the upper left, drawn early in the artist's career, appear in stiff profile, consistent with the stylized manner of Wilson and others. The lively pose of the immature goshawk perched at the top, created after several decades of firsthand observation, reflects Audubon's mature style. This bird was probably sketched in 1829 in Pennsylvania's Great Pine Swamp (now Penn Forest in Carbon County). Together, these likenesses show how, over the years, Audubon transformed his images from portraits of dead, stuffed specimens to vignettes of dynamic, animated birds. The first artist to portray birds consistently in life size, Audubon employed different formats for small songbirds than for larger hawks, owls, and shorebirds. He varied his approaches-- nearly a decade apart-- to portray the great American white pelican. His first version emphasized the bird's ungainly appearance on land with its short, thick legs, large feet, flattened body, and small head supporting a huge, broad bill. (The V~formation of pelicans soaring in the distance suggested their grace in flight.) Attracted to the species by its "gravity and stateliness," Audubon apparently concluded that this image was too undignified and never printed it. Instead, he executed a second version, a majestic profile, which accurately recorded the subtly different shades and textures of the pelican's plumage and anatomical structure. This image debuted in The Birds of America. Audubon chose distinctive backgrounds for depictions of the owl, a bird often sighted in Pennsylvania. He portrayed the great gray owl, head turned in characteristic pose, against a blank background, heightening the definition of the subject's monochromatic, brownish plumage. On the other hand, the brown, black, and white feathers of Audubon's snowy owls were juxtaposed dramatically against a dark, stormy twilight sky. Examining both in their original versions, executed in watercolor, graphite and pencil, a viewer can almost feel the texture of their plumage. Believing he had made sufficient progress on his project, Audubon in 1824 took his portfolio to Philadelphia, then the nation's intellectual, scientific, and publishing center, to seek not only financial support, but an engraver to copy his drawings and a publisher. Posturing as the penultimate "American Woodsman," Audubon dressed in buckskins and slicked his shoulder-length hair with bear grease and vigorously set out to promote his bird book. Some of Philadelphia's intelligentsia were put off by Audubon's unusual appearance and lack of academic credentials, but James Mease, a friend of his wife's family and curator of the American Philosophical Society, admired his ambition and introduced him to influential individuals. Genial Thomas Sully [1783-1872], the prominent portrait painter, applauded the newcomer's work and, perhaps because he doubted Audubon's oft-repeated (and untrue) claim that he had studied under the famous French painter Jacques-Louis David [1748-1825], gave him free lessons in oil painting. "I have never seen in Europe drawings of birds by the first masters," Sully wrote in a letter of recommendation, "but I do not hesitate to declare that those of Mr. Audubon, for strength, expression and exquisite resemblance far exceeds them all. No eulogy of mine, could, however, express their merits." Mease introduced Audubon to Napoleon's twenty-one-year-old nephew, Prince Charles Lucien Bonaparte, a fellow emigre, prominent member of Philadelphia's social and scientific circles, and a recently elected member of the prestigious Academy of Natural Sciences. A knowledgeable ornithologist and artist himself, Bonaparte recognized the value of Audubon's bird portraits and took him, on 05 April 1824, to show his work to members of the Academy, the country's most important natural history institution. Even though Alexander Wilson had died more than a decade before, members of the Academy of Natural Sciences revered his memory and considered his American Ornithology definitive. Several members even retained a pecuniary interest in the sale of his books. With characteristic audacity and tactlessness, Audubon immediately offended the august group by disparaging Wilson's lifeless images and touting the virtues of his own work. Academy members who admired Wilson's classic poses resisted the animated images of Audubon, whom they considered arrogant and brash. Dyspeptic George Ord, Wilson's editor, biographer and executor, was busy preparing a new edition of Wilson's works, and he had a vested interest in protecting the naturalist's reputation. Ord mounted a spirited defense of Wilson's oeuvre and challenged Audubon's integrity and scientific credentials. Audubon responded in kind and the meeting broke up amidst bitter animosity Although some Academy members recognized the quality of Audubon's portfolio, the ugly confrontation led most to support Ord in successfully blacklisting the outsider among local engravers and publishers. The zealous Ord conspired for years afterwards to discredit Audubon, both in this country and in Europe. Audubon branded Ord and his allies "the Philadelphia Sharks." Audubon's critics, believes Robert McCracken Peck, a fellow of the Academy of Natural Sciences and an Audubon authority "considered the emotional content of his paintings incompatible with objective scientific analysis." Some (who were often proved wrong) contested the accuracy of Audubon's compositions, underscoring personal animosities and petty jealousy among those who had tried to undermine him. Alexander Lawson, a Wilson disciple and Philadelphia's best printmaker, had engraved plates for Wilson's books and took great personal interest in their promulgation. He advised Audubon that the likenesses in his portfolio were "extraordinary for one self-taught," but added, rather patronizingly, "we in Philadelphia are used to seeing very correct drawing." When Bonaparte announced he intended to buy Audubon's watercolors, Lawson responded, "You may buy them, but I will not engrave them. . . Ornithology requires truth and correct lines-here are neither!" Dismayed but not daunted by the rejection of the leaders of Philadelphia — which he called "this icy city" — Audubon paid a brief, nostalgic visit to Mill Grove and then tried his luck in New York. Unflattering rumors spread by Ord and Lawson preceded him, and he could find no financiers. While traveling the East Coast, he stopped for a few days in Meadville ("its appearance was rather dull," he opined) and Pittsburgh, supporting himself through portrait commissions and art lessons. He met George Lehman, a Swiss immigrant and skilled landscape artist from Lancaster County, who later joined him on field trips and supplied lush backgrounds typical of many plates of Audubon's bird images. Convinced he could find no support in the US, Audubon in 1826 bade farewell to his wife and sons and sailed for Great Britain. He and his works of art were enthusiastically received at meetings and exhibitions in England and Scotland. His odd "American Woodsman" look, which had proved disastrous in Philadelphia. fascinated Britons familiar with the legend of pioneer Daniel Boone [1734-1820] and the frontier tales of novelist James Fenimore Cooper [1789-1851]. Encouraged, Audubon engaged the services of gifted London engraver Robert Havell Jr., and embarked on the decades-long process of transforming his brilliant watercolors into salable prints. While the artist tightly supervised Havell's work, the pair cooperated in changing some compositions and backgrounds to enhance the appearance of the final versions. After three years abroad, Audubon returned to the United States in 1829. He spent time in Camden and Great Egg Harbor, New Jersey, and passed through Mauch Chunk (now Jim Thorpe, Carbon County seat), on his way to a six weeks stay in a cabin in Pennsylvania's Great Pine Swamp, which he preferred to call Great Pine Forest. While exploring the area he produced numerous bird portraits. Noting that a third of the forest had disappeared by the time he arrived, Audubon regretfully reported that timbering continued every day, and during "calm nights, the greedy mills told the sad tale that in century the noble forest around should exist no more." "I am at work and have done much," he wrote in early October 1829, after leaving the Great Pine Forest, "but I wish I had eight pairs of hands, and another body to shoot the specimens, still I am delighted at what I have accumulated in drawings this season. Forty-two drawings in four months, eleven large, eleven middle size, and twenty-two small, comprising ninety-five birds, from Eagles downwards, with plants, nests, flowers, and sixty different kinds of eggs. I live alone, see scarcely any one, besides those belonging to the house where I lodge. I rise long before day and work till nightfall, when I take a walk and go to bed." Although he sailed to England several more times, Audubon devoted much of the next decade to a renewed search for birds to illustrate, creating some of his most powerful and accomplished likenesses, such as the gyrfalcon, the largest of all falcons and one of the world's great predators. Although this bird is occasionally seen in the mid-Atlantic states in winter, Audubon based his 1837 version on a white-phase female he spotted in Great Britain. He meticulously rendered the gyrfalcon's muscular legs, hooked beak, and sharp talons, ideal for taking birds and small animals. His masterful blend of pastel, watercolor, gouache, delicate washes and pencil is considered by many to be Audubon's most beautiful work. Even though Audubon strove for accuracy, he did occasionally take liberties with nature. A gathering of ten woodpeckers, such as he portrayed, is contrary to the solo or family group manner in which this species feeds. This group composition enabled him to illustrate the subjects' purposeful nature and often conspicuous courtship between male and female flickers. John James Audubon (1838), painted by G.PA. Healy when the naturalist was fifty- three years old. Common American Swan (Male) is one of more than four hundred plates in The Birds of America. Audubon composed one scene no one will ever again witness: a group of brightly-hued raucous Carolina parakeets. Once common in this country, these animated birds — the only parrot native to the United States — became pests to farmers, who slaughtered them in great numbers, as did hunters seeking feathers for women's hats. They were extinct by 1920. The artist's depiction of this lost species, in a brilliant pattern of greens, vermillions. and yellows, constitutes a complex, decorative, challenging-- and ultimately successful-- group portrait exemplifying Audubon's finest work. After publication of The Birds of America, Audubon issued a highly successful, smaller, seven-volume octavo edition priced at $100 (Two first octavo editions recently sold at Christie's for more than $25'000 each.) He also compiled an important work documenting mammals, The Viviparous Quadrupeds of North America, comprising one hundred and fifty hand-colored lithographs in three volumes. In his later years he was assisted by his sons, both talented artists in their own right, who were trained from childhood to help him in all aspects of his far-reaching endeavors. Audubon's reputation was sufficiently secure by 1831 and Charles Bonaparte and fellow supporters in Philadelphia were able to overcome George Ord's objections and elect him a "correspondent," or honorary member, of the Academy of Natural Sciences. It was an honor he proudly acknowledged in his subsequent publications. Both the Academy of Natural Sciences and American Philosophical Society subscribed to The Birds of America, as did John Wetherill, a member of the family which owned Mill Grove. Audubon apparently attended only two meetings of the Academy, in 1839 and 1845. His sons were also elected corresponding members. Audubon's years of prodigious effort, assisted by his devoted wife and sons, eventually produced enough income for him to settle comfortably on Minnie's Land, a small estate on the Hudson River in New York. Senile toward the end, Audubon died at Minnie's Land at the age of sixty-six on 27 January 1851. John James Audubon's place in history was assured by his changing forever the way in which birds are illustrated. While replicating physical features with uncanny veracity, he incorporated narrative elements and aesthetic touches which made birds come alive in their natural environments and lifted the images to the status of fine art. In many ways, the vision and masterful artistry, Audubon images transcends the subjects they depict. Like great paintings, great writing, or great music from any age, Audubon's birds, abundant or extinct, will live forever as the masterworks of one of the US's most gifted artists. A recent touring exhibition organized by the New York Historical Society, showcasing about ninety watercolors for the artist's culminating masterpiece, The Birds of America, offered a once-in-a-lifetime experience for both art and bird lovers. The remarkable freshness and vitality of these painstakingly conserved, life-size images underscored Audubon's genius not only as a meticulously accurate ornithological recorder, but as an artist of exceptional talent. That this was the first traveling show of these treasured watercolors since they were acquired from the artist's widow by the historical society in 1863 helps explain why he has been given such short shrift over the years by scholars of US art and culture. But no more. John James Audubon's bird portraits are refreshingly diverse, deft in composition, brilliant in color, startlingly realistic, and dynamic in depicting each subject in characteristic action. Their existence confirms Audubon's place in the front ranks of nineteenth-century US artists. Uniting entrepreneurship with the technical demands of scientific illustration and the innovative and aesthetic qualities of high art, John James Audubon created a rich and timeless legacy. In setting the standard against which all wildlife art is measured, he bequeathed an authoritative gallery of US birds in images of palpable vitality, striking originality, and profound beauty. Considering the struggles required to produce them, these images are truly Audubon's-- and the US's-- winged victories. �- White Gerfalcons (700x448pix, 36kb) _ .detail 1 (800x738pix, 53kb) one bird _ .detail 2 <(692x1000pix, 44kb) the other bird. — Purple Boat-tailed Grackel (1822, 47x60cm; 600x460pix _ ZOOM to 1400x1073pix) _ this is Quiscalus major. 2003 Caroline Herz Newhouse, 94, German-born sculptor and artist who came to the US in 1934, and is better known as the philanthopist widow of Theodore Newhouse [–1998], a co-founder of the Newhouse communications company, whom she married in 1956. ^ >1927 Eduard Zetsche, Austrian painter born on 22 December 1844. He first became a banker. Then he studied watercolor under Robert Ru� and his friend Emil Jakob. From 1874 to 1879 he was a student at the Wiener Akademie under E.Peithner-Lichtenfels From 1879 to 1881 he studied in D�sseldorf under E. Dr�cker. In 1881 he moved back to Vienna and was a member of the Wiener K�nstlerhaus. His paintings are mostly landscapes near Vienna, and in the Wachau, Waldviertel, in the north of Germany. 1690 Hendrik Verschring, Dutch artist born in 1627. 1831 Timoléon-Marie Lobrichon, French artist who died in January 1914.